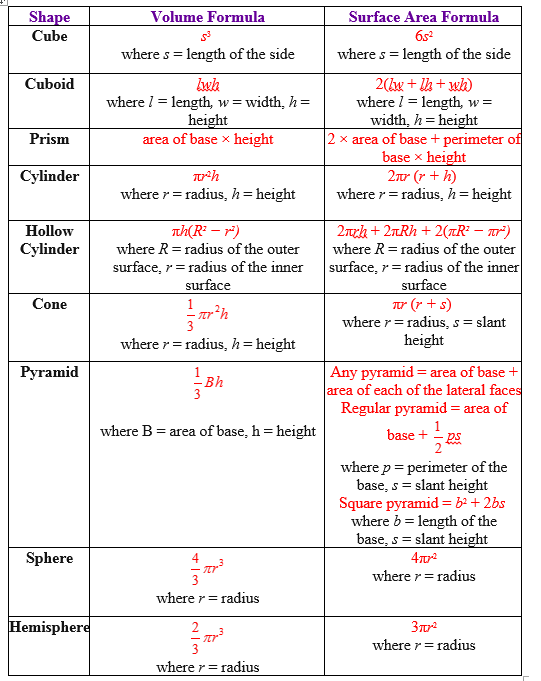 a table of volume formulas and surface area formulas used to calculate the volume and surface area of three-dimensional geometrical shapes: cube, cuboid, prism, solid cylinder, hollow cylinder, cone, pyramid, sphere and hemisphere. a more detailed explanation (examples and solutions) of each volume formula. The following table gives the volume formulas for solid shapes or three-dimensional shapes. Scroll down the page if you need more explanations about the volume formulas, examples on how to use the formulas and worksheets. A cube is a three-dimensional figure with six matching square sides. 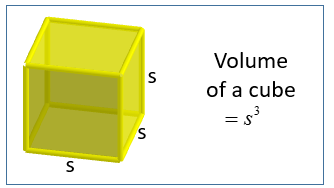 The figure below shows a cube with sides s.
How to find the volume of a cube? The formula for the volume of a cube is s × s × s = s3, where s is the length of a side of the cube. A rectangular solid is also called a rectangular prism or a cuboid. In a rectangular solid, the length, width and height may be of different lengths. How to find the volume of a rectangular prism or cuboid? The formula for the volume of a cuboid is l × w × h = lwh, where l is the length, w is the width and h is the height of the rectangular prism. This video will give two examples of finding the volume of a rectangular prism. 1. Find the volume of a rectangular prism with sides 25 feet, 10 feet and 14 feet. 2. Find the volume of a rectangular prism with sides 5.4 inches, 7.5 inches and 18.3 inches. A prism is a solid that has two parallel faces which are congruent polygons at both ends. These faces form the bases of the prism. The other faces are in the shape of rectangles. They are called lateral faces.A prism is named after the shape of its base. When we cut a prism parallel to the base, we get a cross section of a prism. The cross section has the same size and shape as the base. where A is the area of the base and l is the length or height of the prism. How to find the volume of a triangular prism? This video shows how to determine which is the base and the height of the triangular prism. A cylinder is a solid that has two parallel faces which are congruent circles. These faces form the bases of the cylinder. 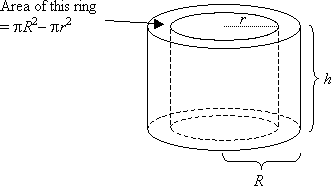 The cylinder has one curved surface. The height of the cylinder is the perpendicular distance between the two bases. where r = radius of cylinder and h is the height or length of cylinder. 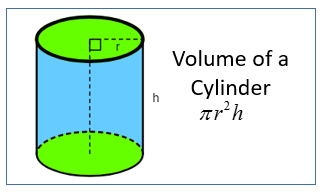 How to find the volume of a cylinder? Sometimes you may be required to calculate the volume of a hollow cylinder or tube. 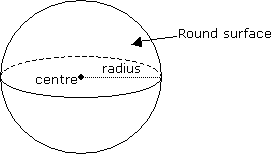 where R is the radius of the outer surface and r is the radius of the inner surface. How you can find the volume of a hollow cylinder and a cone using the formula of volume of prism and pyramid? 1. Given a pipe with length = 12cm, outer diameter = 2m and thickness = 40cm. Calculate the amount of concrete used? 2. Given that an ice-cream cone has a diameter of 65mm, height of 15cm and thickness of 2mm. Calculate the volume of wafer in the cone. A cone is a solid with a circular base. It has a curved surface which tapers (i.e. decreases in size) to a vertex at the top. The height of the cone is the perpendicular distance from the base to the vertex. V = where r is the radius of the base and h is the height of the prism. How to find the volume of a cone? Find the volume of a cone with radius is 12ft and height is 16ft. A pyramid is a solid with a polygonal base and several triangular lateral faces. The lateral faces meet at a common vertex. The height of the pyramid is the perpendicular distance from the base to the vertex. The pyramid is named after the shape of its base. For example a rectangular pyramid or a triangular pyramid. V = where A is the area of the base and h is the height of the pyramid. How to find the volume of a pyramid? Make sure that you use the vertical height to substitute into the formula and not the slant height. Find the volume of a pyramid with sides = 9ft, vertical height = 5ft and slant height = 8ft. Volume of sphere = where r is the radius. How to find the volume of a sphere? How to find the volume of a hemisphere?